I love dinner parties... going to them, throwing them. They're like little projects and heaven knows, I love a project (implementation plans and all). Plus with the new house and proper kitchen I was dying to give one a whirl and Papa's Wife was the perfect excuse for a whirl. Papa's Wife works hard, she has a full time job then comes home and cooks for her husband and takes care of her ninety year old mother. She does the bookkeeping for Brother-in-Law's business, watches La Petite every other weekend, and hosts the family every Sunday for lunch. Plus, she's always been really nice to me so I thought it would be nice to serve her Sunday lunch for once. 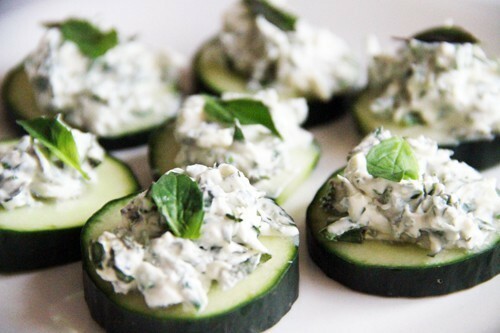 Like little nibbles for an appetizer, they're so much more fun. I stirred chopped basilic and ciboulette (basil and chives) into France's answer to Philly Cream Cheese, St Môret, and topped cucumbers with it. C'est tout! And because they're so damn good, I made the Mad Men deviled eggs that I had made for Gatz's birthday again. I think it's the capers that make them so good. I love a caper. Besides little nibbles, I knew that I wanted to make something that I could prepare a couple hours ahead and since Chicken Piccata can be prepared a couple hours ahead, and has capers in it, it seemed like a solid choice. Throw it on top of some linguine and voila (I can't seem to find an appetizing photo of chicken piccata so please use your imagination for this one). Mangoes in Cinnamon Custard. Yes please. Saturday I went out and bought another mango (just in case, you know) and later that night made the custard. The next morning, a few hours before lunch, I began to cut the mango and made the oddest discovery... that large, round, ball of fruit that Papa's Wife had given me wasn't a mango, it was a giant freaking avocado! An avocado the size of a softball! Now maybe mangoes don't come in that size but neither do avocados. Color me shocked. Good thing I had my 'just in case' mango to save the day (ABP... always be prepared... take that freakish softball avocado). But, if it wasn't for that weird and freaky, softball sized avocado, I never would have made the most delicious dessert there ever was. P.S. all of the recipes can be found on my Pinterest boards; delish dish and sweets for my sweet. Thankfully she didn't mention the avocado. She loved the lunch, turns out cucumbers are her favorite so gold star for me on that one! You should make avocado cake with your avocado - it's yummy! so I always run through the pics before I read blogs. 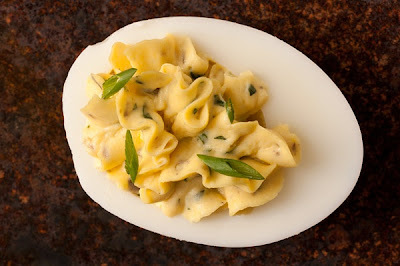 Totally wanted that white plate with the pasta on it. Only its AN EGG! and cinnamon on anything is the bomb. You rock, as usual. Your menu sounds delish! I have an avocado in my fruit bowl now and I am not sure how to use it! Maybe I will try the above suggestion of an avocado cake:)Hope you have a great weekend! I'm going to make the cucumbers for my lunch. right now. you pushed me over the edge of starving. That entire menu sounds delicious and just perfect for summer! Can I just say that I love following you on Pinterest? I love what you pin! ...and only you would have a "just-in-case" mango!!! So funny! Why was the avocado yellow? The avocado/ mango was green, but I couldn't for the life of me figure out what it was. It was shaped like a mango, so I thought that maybe it was a mango that turned green with time. I don't know! Don't judge me! This isn't helping my diet very much. Oh my God, the cucumbers. The cheese. Le siiiiiigh. Also, I thought avocados have a tough brown skin? Right? Totally not your fault for the mango mistake. One of my favorite things about your blog is the language barriers... like when everyone kept referring to the tortillas as crêpes. I almost couldn't stop laughing when I read that. Adorable! And I will definitely have to try that fruit dish. My mouth is watering. By the way, what did you do with the avocado? lol!!! tell me you did something awesome with the avocado!! and that mango dessert sounds amazing, even though I'm generally not a fan of mango. 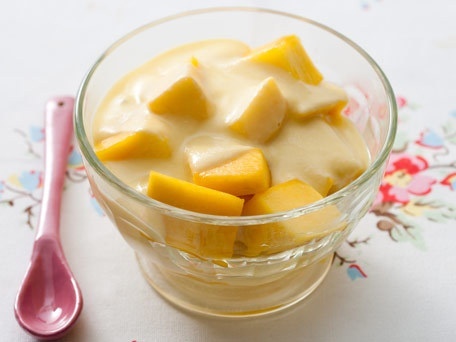 I need to make this mango dessert ASAP!! Sounds AMAZING! I love cooking for other people! Yeah..a pic of the avocado is due!! Your dinner sounds delicious. So what did you do with the avocado? Guess you had a funny story for starters,eh?